Thanks to our donors, who helped us in arranging a JCB to clear debris from IGZP, Visakhapatnam. Distribution of blankets to Hudhud devastated villagers of Muthyalammapalem panchayat. 1100 families were given blankets. Drinking water for 2 days for 5 Hudhud effected villages of Muthyalammapalem panchayat was facilitated by MEECONS by supporting generator expenses. Water logged area in Hudhud effected villages have a risk of increased mosquito population. Larvicide was sprayed by MEECONS in 5 villages. Thanks to our donors, we could support a Primary and High School with their needs and support for repair work after Hudhud. Our main focus - workshops and movie screenings. Photos from our first workshop - Snake Awareness Workshop and a movie being screened during workshop. Sparrows feeding from bird feeders placed in our members house to help sparrows. In association with TCT, we distribute nest boxes and feeders. Mangroves which have a crucial role to play in our ecosystem. We strive to protec the mangroves of Visakhapatnam through awareness. We conduct beach cleaning campaigns every year, it is to involve as many people and to let them know how much we are spoiling our beaches. Signature campaigns and campaigns to save large trees is also one of our priority. We were part of saving 127 years old tree from GVMCs axe. 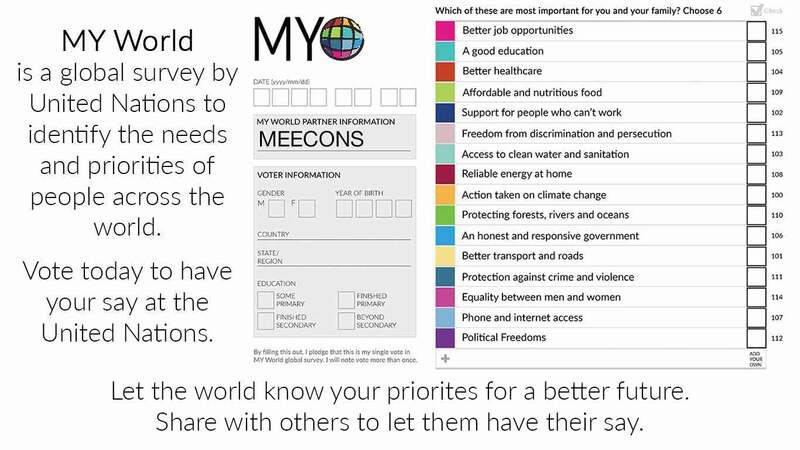 MY World 2015 is a global voting by UN to identify key issues which people think are important to them. One has to choose six from sixteen issues listed out by the UN. Give your vote below. India Clean Sweep is an event initiated and coordinated by Chennai Trekking Club, a non-profit volunteer based group of nature and trekking enthusiasts from Chennai. The event is happening on 8th June, 2014 at ten different locations in South India. These include Chennai, Banglore, Pondicherry, Coimbatore, Kanyakumari, Trichy, Tuticorn, Tirunelveli, Hyderabad and Vizag. A total of more than 150 organization are together doin this event in these ten cities. In Vizag MEECONS is organizing it. 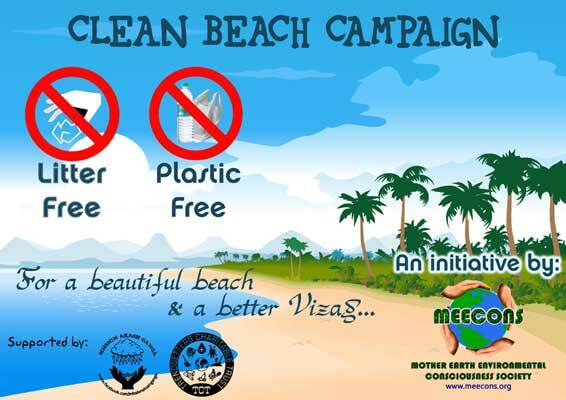 As anuual beach cleaning event MEECONS is organizing Coastline Cleaning Campaign - III in Vizag as a part of India Clean Sweep. A total of 400 volunteers will be participating in the beach cleaning event. All the registered participants will be given certificates. Post by Coastline Cleaning Campaign. CCC-III has been a good event with the partiicpation of more than 120 members, the garbage collected was 1.2 tons. Thanks to the volunteers who have come even when Vizag had a soaring heat the previous day and on the cleaning day. Thanks to their commitment. A thanks to each and every member of MEECONS who have made the event successful with their respective inputs. Join us in making Vizag beaches plastic free and litter free. You can volunteer for this cause by spreading the message and getting more people sign the petition. For details click on the CBC image above.